A four-year starter in college, Brown was chosen by the Steelers in the second round of the 1993 NFL draft. He moved into the starting lineup at inside linebacker due to an injury to Jerry Olsavsky and, while a raw talent, performed ably with three sacks, two forced fumbles, and 69 tackles. 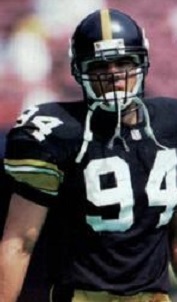 Brown excelled in 1994 as part of an outstanding linebacker corps, compiling 8.5 sacks and 90 tackles, and was used as a rushing defensive end on passing downs. He missed six games due to injuries in ’95. After three years, Brown totaled 17 sacks and 218 tackles. Steelers went 10-6 to finish first in the AFC Central while leading the conference in sacks (51), fewest total yards allowed (4362), fewest passing yards allowed (2947), and fewest points allowed (257). Won AFC Wild Card playoff over Indianapolis Colts (42-14). Lost AFC Divisional playoff to New England Patriots (28-3). Brown departed the Steelers for Seattle as a free agent in 1997. Playing at right OLB in a 4-3 scheme, he led the Seahawks with 104 tackles while also registering 6.5 sacks and scoring two touchdowns among his four fumble recoveries. Brown was credited with a career-high 149 tackles in ’98, receiving consensus first-team All-NFL honors and garnering the first of two consecutive Pro Bowl selections. He spent a total of eight seasons with Seattle, continuing to be a fine playmaker if also showing signs of wear. He left the Seahawks after the 2004 season and, in his last three years, played for the Patriots twice with a return to Pittsburgh in between. Overall, over the course of 15 seasons and 188 games, Brown compiled six interceptions, 15 fumble recoveries, three of which were returned for TDs, 79 sacks, and over a thousand tackles. He received consensus first-team All-NFL honors twice and was chosen to three Pro Bowls.